Never should have bragged on the team. Today as I was coming back from feeding, I stopped them at a gate and got off the wagon to shut it, just like I always do and when I was just getting it shut they left. I managed to run fast enough to get on the wagon and work my way up to the lines and get a hold of them and stop them. But I wasn’t happy! And when I got done training on them about “Whoa” I don’t think they were either! Never brag on kids, pets or horses! I think it was all because of the wild wind blowing. But they still should know enough to wait for me by now. Just wonderful out there this morning. Not much for a breeze and above freezing. I know, all you southern people think I’m crazy, but this is real nice. Kind of like when it drops to 90 degree’s in the summer and it feels so nice, to the southerners I suppose. The team walked almost all the way over to the stack yard on a loose rein. And almost all the way out to feed the bale and back home too. As I expected, they just get a little better everyday. 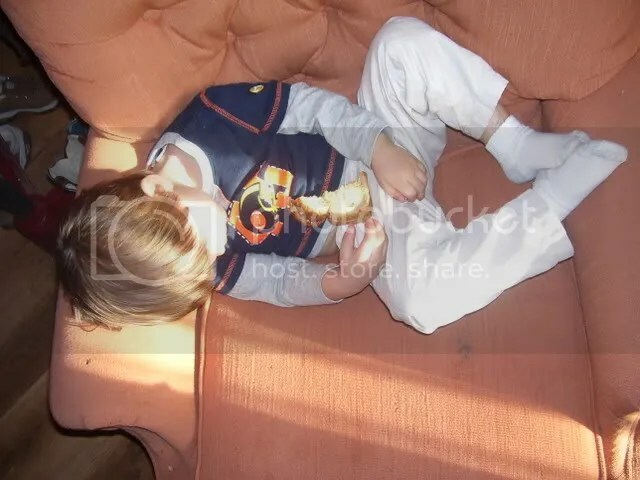 Gabe was sick and went to sleep in the chair last weekend. If I did that I’d sure have a stiff neck. Kids sure are bendable! I’ve been waiting to read something like this. I don’t think most people who are for global warming are aware of the real agenda behind it. Putting money in a few corporations and peoples pockets. Better go read this. Here you go Pixie. Been awhile since I put any horse pictures on here so here you go. 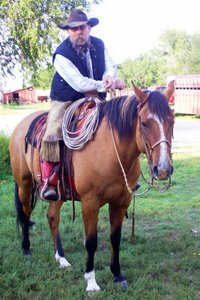 this is my Dad on his Indian pony, Silver. Dad would have been about 10. So this picture would have been taken about 1924. 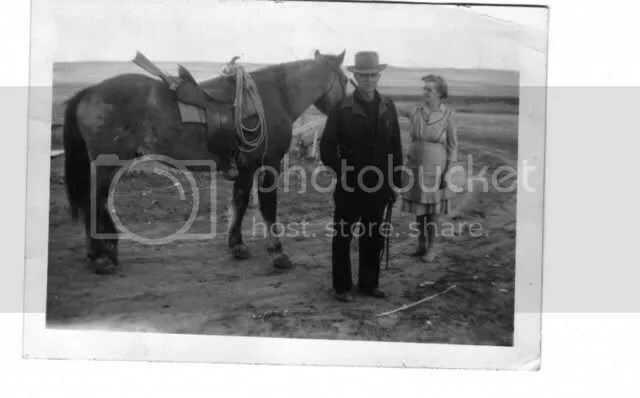 This is one on Walter and Lizzy, my Dad’s parents who homesteaded this ranch. This would have been taken in the 1940’s. 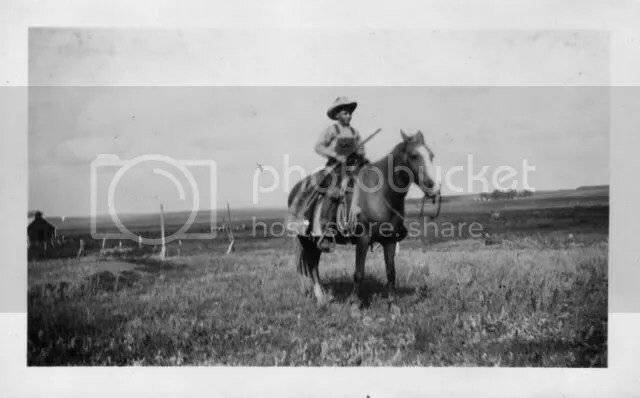 Notice Dad is holding a rifle and Grampa has a rifle in his saddle scabbard. This is a Winchester 25-20. When Grampa shot at something with this rifle or with his Winchester pump 12 gauge shotgun, he didn’t miss! At least that’s what Dad always said. Of course there was always one or the other close to his hand and he used them a lot. Practice makes perfect. 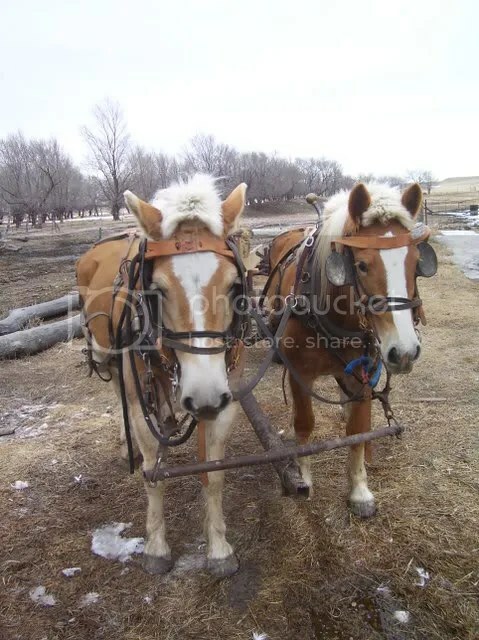 Pretty good lookin’ horses. Sure got some bone to them! I wish I knew what happened to Grampa’s saddle. Man is it nice out there! 32 degrees at 9 am. Just come in from feeding. Them shoes with borium on the front of the team make it a lot better, with all the ice we’ve got. And with days like this one, there is going to be more. Glad I don’t have to ride a barefoot colt out there! I think my shoer is coming bacxk this afternoon and put the shoes on the hind feet. It would be better because there are a few places where they’ve got to get down and pull a little and I don’t wnat them to stifle themselves or anything. Got up to 30 or so ands little to no wind so it seemed nicer. Becca came and got shoes on the front feet of the team so we’ll see how well they do in the morning when I go to feed. Supposed to get up to 50 this weekend. That ought to make it pretty mushy and mucky around here, but I’m sure it will cool off and we will have some ice again. Up to 8 above and that is the high for the day so far! Nasty ol’ south wind blowing at us driving the cold right thru you and the house! I guess I won’t be going anywhere. Got up to 31 today but didn’t feel like it. Cold wind blowing. Supposed to be colder tomorrow and then warm up. I will hope so. Got an old buddy coming to Spearfish tomorrow night for the Heritage show, I think we will run in and watch.